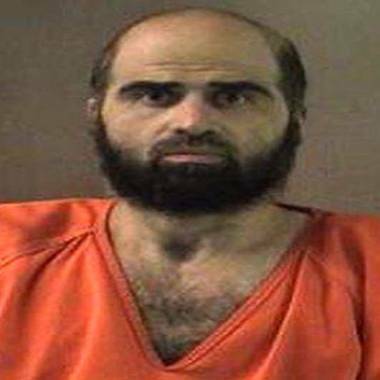 U.S. Army Maj. Nidal Hasan in an undated handout photo. The man charged in the 2009 Fort Hood, Texas, shootings, that killed 13 and wounded more than two dozen has been granted a stay of his court-martial proceedings to appeal a ruling that he must appear in court clean-shaven, Fort Hood announced on Monday. Former Army psychiatrist Maj. Nidal Hasan, 42, was clean-shaven when he was serving in the military. Since he has been in jail, he has grown a beard. He has said that as a Muslim shaving his beard now would be a sin, because he believes he is close to death, the Los Angeles Times reported. If convicted of the Nov. 5, 2009, attack, Hasan faces the death penalty or life in prison without parole. Military court requires that defendants be clean-shaven, and the court has found Hasan to be in contempt and fined him $1,000 each time he has appeared in court with the beard. A military appeals court in Virginia on Thursday upheld a judge’s ruling that Hasan can be forcibly shaved for the court-martial. But on Monday, the U.S. Court of Appeals for the Armed Forces issued another stay to accommodate an appeal. The court did not say how long the stay would remain in place. Hasan's court-martial was initially scheduled for August.